MOST people have been getting hugs from him this week. Maybe Sandy Lyle did, too. At Tuesday night’s Champions’ Dinner, though, the “new” Tiger Woods was more interested in talking to the Scot after hearing he had played Augusta National last Saturday with a set of hickory clubs. It should be pointed out straight away that Lyle is a dab hand with old sticks in his hands. Last year, at Panmure, he was crowned as the World Hickory Open champion, a title he is proud to hold. He was “disappointed” not to break 80 with them on this occasion, but is keeping the putter in his bag for the main event. “I played round here on Saturday with them. It was windy and I’d just driven up for five hours. I wasn’t quite on full swing. My challenge was to break 80, but I didn’t. It was off the back tees, mind you. I parred the first and the 18th. Making his 34th appearance this week, Lyle is still deadly serious about trying to get into contention every time he comes back here. He has made the cut the last two years and is pleased his game is in “reasonable shape” again after struggling so far this season on the Champions Tour. Before getting his second Masters underway today, Stephen Gallacher will join the throng around the first tee to watch the three honorary starters – Arnold Palmer, Jack Nicklaus and Gary Player – get the event’s 79th staging underway. Gallacher finished a respectable joint 34th on his debut 12 months ago, when only a third-round 81 took the gloss off his week’s work. “The first time you come here you are hit by the ‘wow factor’,” he reflected. “Second time around you know what to expect. I played half decent last year and now it’s a case of trying to build on that by finishing higher. 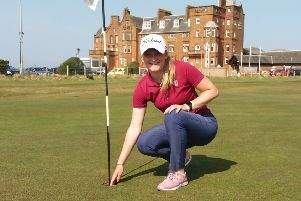 “I struggled a wee bit off the tee in my other practice rounds but played lovely today. It can be difficult to maintain your concentration when you come out early, as I did, so I just want to get started now. Interestingly, McCloskey’s last piece of advice before his man heads for the first tee in the company of Swede Jonas Blixt and American Kevin Streelman will not be anything technical. “The best thing I can say to Stevie is to go out there on that first tee with a big smile on your face as these are the best days of his golfing life,” he said.